Hi everyone! I hope everyone is having a great summer! I would like to share with you some of the best works submitted to watercolorists in the month of July. Please vote for your favorite in our monthly poll. It is one of the most realistic painting I've ever seen. 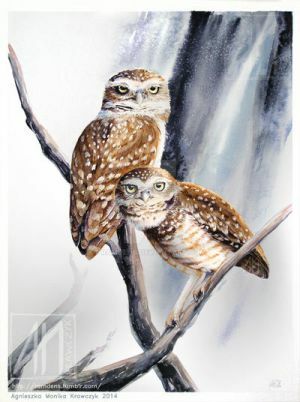 This whole painting makes me feel like i'm watching owls in their habitat. It is absolutely wonderful. First off I love this artist's Ireland paintings. This painting perfectly captures the sunset or sunrise, and city skyline. An expertly painted street-scape with beautiful reflections. I'm a huge sucker for doctor who but normally I dislike fan art. It's hard not to love this piece, it's got great colors and style and seems to be a interpretation of a certain "Van Gogh" . I love how powerful this is. 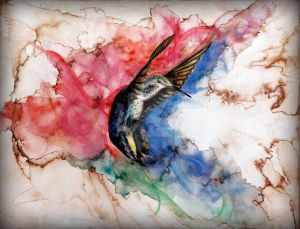 A hummingbird creating a whirlwind with it's wings. "Prosopagnosia" is the title of this piece, it's also the name of a disorder called face blindness where one can't recognize faces. It's hard for us to imagine people like this but this piece does a perfect job. When I saw this I immediately though this should be a holiday card or a postcard. Winter in July! There has been a great trend in this style of painting but this takes the cake by far. I love that they only used three colors and white. It's also a great tribute to John Lennon. Lovely use of colors, contrast, feels very vibrant and natural. Thanks for looking! Please support the wonderful artists that give their time and love to the group. Keep submitting your works, and don't forget to vote! THANK YOU SOOO MUUUCH !!! Thank you very much for featuring my work and for such a lovely comment! Month of July features!Hi everyone! I hope everyone is having a great summer! I would like to share with you some of the best works submitted to watercolorists in the month of July. Please vote for your favorite in our monthly poll.